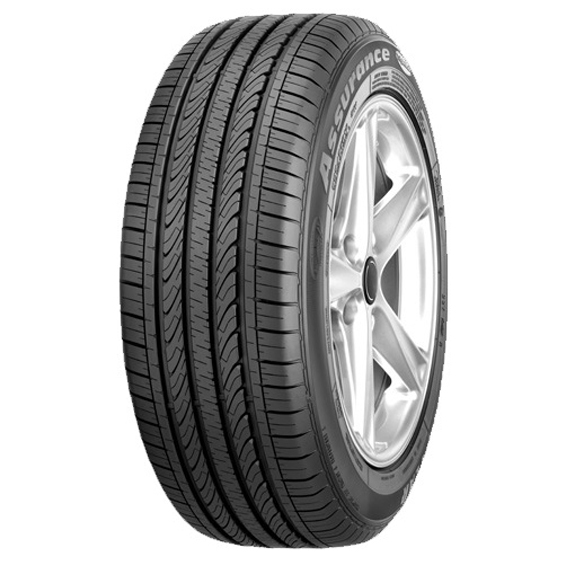 Goodyear Assurance Triplemax is an original equipment tyre dedicated to the uncertain conditions of Indian roads. With its wide rim size range, it suits numerous cars in the country. Launched with a catchy line “Maximum Braking Ability, Maximum Wet Grip and Maximum Control”, the Assurance Triplemax guarantees best in segment braking, superior wet grip and stability under unfavourable weather/road conditions. One of the key aspects of Goodyear Assurance Triplemax tyre is its low rolling resistance that ensures minimum fuel intake resulting in less carbon footprint emissions. Use of unique rubber compound at the tread provides Assurance Triplemax a long lifespan, while the advanced technology at the tread groove design ensures even balance between comfort and stability. The tyre handles well under hazardous wet and slippery conditions alongside offer better steering and braking response under traffic ridden city conditions. It gets a wide contact patch that ensures shorter braking distance under emergency braking at high speeds. Goodyear Assurance Triplemax is equipped with the HYRDOGRIP technology that involves advanced polymer tread compound, which has an enhanced molecular bonding that leads to high traction. The Assurance Triplemax has biting edges with large block elements that offer an improved contact area for additional safety under hard braking conditions. The FEA neutralized stress ply line delivers low internal components stresses and low internal abrasions that ensure cool running of the tyre. It has a wide-faced cavity that has a large surface contact area which uniformly dispenses pressure when driving and diminishes rolling friction. With the use of innovative polymer tread compound in Goodyear Assurance Triplemax and enhanced molecular bonding, the maximum grip level is achieved under wet and dry setups. 1.0 average based on 1 review . Worst tyre ,just driven my vehicle for 500km .tyre damaged .I would recommend people don’t ever think of buying good year tyre.